"Facts disprove warnings about global warming"
Global warming on other planets? Carbon Dioxide Information Analysis Center of the U.S. Department of Energy. Greening Earth Society and World Climate Report--science of global warming. National Climate Data Center--at the NOAA. PERC Center for Free Market Environmentalism. Petition Project--independent petition opposing the Kyoto treaty. Science and Environmental Policy Project. USDA UV-B Monitoring and Research Program. World Data Centre for Greenhouse Gases--by the Japan Meteorological Agency. Bellona Foundation--foundation in Norway, primarily concerned with environmental impact of Soviet/Russian defense and nuclear activities. Intergovernmental Panel on Climate Change of the United Nations. 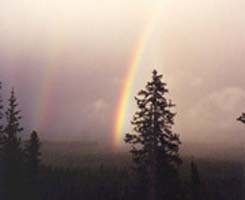 Banner image: taken in Yellowstone NP in 2000 (credit: Johnston, © 2000). Copyright © 2001-2008, 2015 by Wm. Robert Johnston. All rights reserved.